The Class Teacher is Miss Harrison and the Teaching Assistant is Miss Cross. We have lots of exciting things happening in Year Four this year. Welcome back, we hope you have had a lovely Easter break. This term, we will be developing our learning about the Ancient Egyptian Civilisation. We will be exploring our geographical and historical skills as we make our way across the world to Egypt. We will be using the 8 points of the compass and 6 digit grid references in our geographical learning, we will continue to apply these in PE through orienteering. Please note that Year 4 PE lessons will be on Mondays and Wednesdays so please ensure children come with their PE kits on the first day back. Continuing our journey to Ancient Egypt, we will be exploring the discoveries made by Howard Carter and through our work on how the pyramids were built will be exploring states of matter. This term, we will continue our performing skills as we learn to read musical notation, play and compose music for recorders. We have a busy term ahead with a local history, and our annual sports trip coming up this term. Please make sure letters come back promptly and if you are available and willing to support on a trip please speak to one of the Year 4 Team. After a wet and windy walk to St Thomas Church, the children shared their Easter Collective Worship with their family, friends and members of the church. The children performed loudly, clearly and sang beautifully. When the chicks came to visit! We had a fascinating time when the chicks came to visit in 4H, they were all so well behaved! Today, we shared with our grown-ups our learning about Holi. We used the enjoyment, fun and happiness spread during Holi to complete our own colour dash run. Parents and children from Year 4, had a fantastic time chasing and racing and splashing colour at eachother. We all loved the experience and teamwork! Having an 'eggcellent' time as new life arrived! We were the fortunate visitors to meet the newly arrived chicks, as they hatched into our St Thomas family. The children showed fascination at their arrival and couldn't wait to go back and see them after the weekend. We had a 'cracking time'! Which is the greatest book? For World Book Day, we have been exploring 3 amazing texts throughout our English and Guided Reading. Today we voted on which we thought was the greatest book. We chose-Quest by Arron Becker. THe children completed some amazing illustrations and story writing based on this book. We even got 2 twitter responses from Arron Becker!! Today, we have been learning how to draw birds. We experimented with both pencils and charcoal to create our own feathered friends to end our big birdwatch project. Firstly, we read the poem on our own, in pairs and as a class. Afterwards, we explored the vocabulary and its meaning. Then we split into groups and developed our performance, learning the poem by rote. Finally, we evaluated each groups performance and gave 2 stars and a wish to help them develop their performance skills. Great work- i really loved the actions! Today, we have been learning and developing our photograhy skills. We were fortunate that Damien came in to show us how to effectively use light and shadow and creativity to take creative and unusual pictures. We were able to use the prism, light reflecters and other props to help us to take our own environmental art photography. As you can tell, we had great fun. Finally, we evaluated our photos and how we could adapt or edit the photos to be more creative. Here we are, designing our recycled bird feeders, in preparation for the Big British Birdwatch. With our grown ups, we designed the feeders using ipads to research suitable ideas. A few days later, after collecting the recycleables, we independently made our feeders and put them out in the reflective garden. We had a wonderful morning, sharing our class assembly with Key Stage 2 and our parents. We have learnt so much about the importance of electricity and how to keep safe. After learning about #ThomasEdison, 4H have become authors, editors and are currently publishing their own non-chronological reports about him. They've loved learning about how Edison has impacted lives today. In Maths today, we had to draw a 2D shape and sort them by their properties. We moved across the room and sorted ourselves by right-angles, parallel sides, regular and irregular and other criterion. We are consolidating our knowledge of shapes. Yesterday in Maths, we started to learn about quadrilaterals. As a reflection task, we had to use four straws and create shapes with given properties. This definitely improved our understanding of the properties of quadrilaterals. #TeamWorkMakesTheDreamWork , as the children had to use circuit equipment to make complete circuit, which made the bulb light up. The children were given no guidance and after some success the children were challenged to add additional wires and bulbs. Today, we have worked with the representatives from the church to make our Christingles. We were able to share information about the different parts which make up the Chistingle, and what they each represent. We learnt about the charity Save the Children, and collected our donation boxes in order to help make a differnce to children whi need help. We have been very busy in 4H learning all about the history of the Vikings. During our Viking Wow Day, we came dressed up as Vikings and learnt about Viking Runes, weaponry and more of our Viking Music. We even planned a Viking banquet menu. We finished our day off, inviting our grown-ups in to help us to dissect Viking poo to help us to understand the diet of Vikings. This week, we have been very busy learning and developing our sewing skills. We first began practising our straight/running stitch. Developing accuracy and keeping the stitches the same size. Following this, we learnt blanket stitch and how to attach sequins. Look at our lovely stars, we made them independently for our hoop. Here are some of the lovely comments and reviews from our open afternoon on Friday. What incredible feedback. We had a fantastic Friday, sharing our learning with our parents and family during our open afternoon. We were able to use our sketching work to recreate dragons eyes linked to our How to Train a Dragon and Viking work. We are really hooked. Thankyou to all the grown-ups that came, it was a lovely afternoon! It was great to see all the grown-ups getting messy with the clay too! Today, we have been creating a recipe to make a dragon. We chose expanded noun phrases for different features our dragon would need and placed them in the fire before creating our own recipe and instructions. We loved applying our English and Grammar skills! Welcome back 4H. We hope you have had a lovely holiday and you are ready for the excitement of this new term. This term, we will be continuing our topic of Survival of the Fittest with a twist of learning about the Vikings. In English, we will begin reading How to Train Your Dragon-Cressida Cowell, so get reading- you may even watch the film so you can identify how the characters, storyline and events differ. We have lots of exciting learning coming up, and get a costume ready we will have a themed day coming up! A HUGE thank you, to all the grown-ups which took time to come to our parents afternoon. We had a fantastic time sharing our projects, evaluating our soups and we even got to make poppies and learn weaving together. To make it perfect, we rounded our afternoon off with charanga music and some more Mamma Mia. What a fantastic afternoon we had! Wr have loved learning about life in Anglo Saxon Britain. We found out about the typical diet of Saxons and used this learning to plan and make our own Saxon Soup. We even made adverts, packaging and recipies. This week, we have been learning all about Abba and their influence on popular music. Throughout this week we have been learning how to sing Mamma Mia after we gained knowlede about the tempo, pitch and beat. We have loved this unit of work and our understanding of musical terminology has developed greatly! Like the Saxons, we learned how to weave using willow. We carefully had to negotiate the willow, bending at at specific points of equal measures to create wonderful stars ready for the Christmas Fair. We carefully read and followed the instructions to have the best success. While we have been learning about the Anglo Saxons, we have learnt about the craft of weaving that was used as a trade and as part of their culture. We have ued contrasting colours for two pictures that will be woven together as part of our artwork this term. We had a fantastic trip to West Stow Anglo Saxon Village this week. Where we got to investigate how the Anglo Saxons survived in Britain and how historians believed they built their houses. We loved exploring the artefacts in the museum and imagining living on one of the recreated houses- we loved it so much we wanted to stay longer. The childrens natural inquiry and inquisitiveness was fascinating as they asked the staff challenging questions based on their learning in school and what they found out while visiting West Stow. Although, the smiling Hrothga looks cheerful and caring. Was helike that in Beowulf? Today, we interviewed Hrothgar about his experiences with Grendel. We roleplayed as newspaper reporters and made Hrothgar sweat under his gown and crown, as we asked the most challenging questions. Hrothgar and the reporters did a fantastic job! We have been busy learning all about place value. 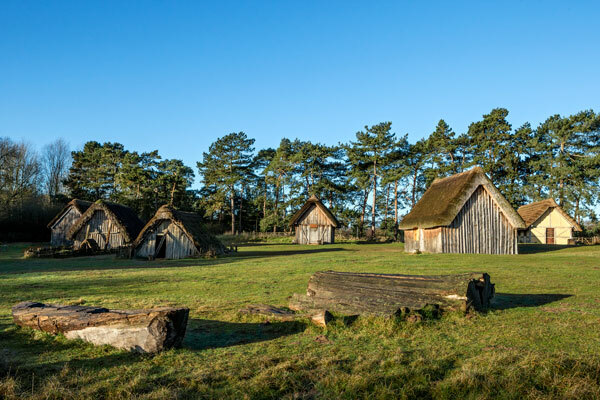 On Thursday20th September we are visiting West Stow Anglo Saxon Village. Get ahead of the game and have a look at their website and get a taste of what we will see and get to learn. Today, we have been busy investigating what life was like for the Saxons, Scots, Jutes and Angles and why they wanted to come to Great Britain. We played an invasion and settling game and we were able to learn how tribes invaded eachothers settlements and what happened to the different tribes. We loved attacking and stealing eachothers settlements. It was great fun! Down by the campfire storytelling! Today we were recreating storytelling like the Anglo Saxons sitting around the campfire. We sat and shared the myth of Beowulf. We have now started reading Beowulf by Michael Murpurgo. Join in reading with us at home.